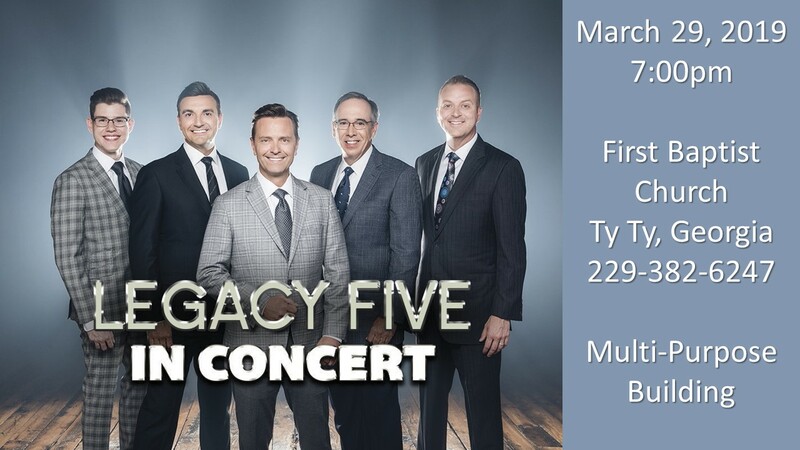 Nationally renowned gospel recording group Legacy Five is coming to the Multi-Purpose Building at First Baptist Church of Ty Ty, Georgia! When the Legendary Cathedral Quartet retired in December of 1999, Scott Fowler and Roger Bennett decided to continue the rich musical tradition of Southern Gospel Quartet singing. Legacy Five was organized and had their official debut in January 2000 in Atlanta, Georgia. Since that day, they have made a major mark on the Southern Gospel Music world. Immediately audiences responded overwhelmingly to their four-part harmony and their ability to effectively communicate the message of Christ. Since the quartet’s formation, they have established and maintained a firm place at the top of Christian music. Legacy Five has enjoyed more success in their short career than many groups experience in decades. In their first ten years, The Singing News Magazine, Southern Gospel music’s leading fan and trade publication, has nominated Legacy Five for some 75 Singing News fan awards. Year after year they are recognized as one of Gospel music’s favorite southern gospel groups. The Southern Gospel Music Association honored Legacy Five with Recording of the year and they have had 2 Dove Award nominations. Legacy Five has been featured on numerous video tapings of the Gaither and friends Homecoming Video series, which has sold multiple millions of copies worldwide. They have also appeared on In Touch, with Dr. Charles Stanley, as well as In Touch Ministries’ sponsored cruises. Legacy Five is also regulars at Dr. David Jeremiah’s Shadow Mountain Community Church in El Cajon, California. Viewers across America have seen Legacy Five on TNN, TBN, Sky Angel, INSP, GMT, The Odyssey Network and a host of local channels. Some 130 times a year, Legacy Five presents Gospel music in a way that has endeared them to audiences all across the United States and Canada.